Smartwatches were touted to be the next revolution in personal computing for the past 3 years, each time with analysts claiming, adamantly and viscously, that the smartwatch revolution was around the corner. First it was 2013, the year that saw the release of the Pebble – but other than this addition to the category, there was not much else to remember. People were expecting Apple to come and take the world by storm by blowing everyone’s expectations with an “iWatch” that would finally force the smartwatch to come of age. But alas, the smartwatches of 2013 came and went with little to no mainstream recognition, and left those extremely-early adopters of the technology largely disappointed, aside from part of the Pebble userbase. The smartwatch market sold a tiny fraction of its big brother industry, with a mere 3 million units having hit consumers’ wrists. Although this number surpassed the prior year’s 300,000 units, considering it was the first year with notable releases it was a disappointment both felt in OEM wallets and consumer’s minds. With this disappointment of a year, technology analysts became a little more skeptic in their forecasts, and there was more rational debate than before about whether 2014 would see the day where smartwatches would transition to a mature product worthy of mass consumerism. However, the market-watchers and logistics still had volatile predictions as to what would happen, with Canalys estimating a shipping of 5 million where as the more optimistic and renowned Forbes predicted the market would hit 15 million devices. While we still haven’t heard official figures from reports, and while we can’t predict whether either the optimistic or pessimistic forecasts were correct, something is clear: Smartwatches still haven’t had the impact that many expected it to have, with mainstream adoption still being delayed. When Pebble released its kickstarter campaign in 2012, the internet was set ablaze with the idea of such a device. The companies looking to compete with Pebble Technology had names and correspondingly fitting hardware ranging from OEMs like Martian or Cookoo – both offering rather stale and uninspiring smartwatches. But Pebble featured all the things current smartwatches inherited: applications, customization, notification glancing and the most important aspect: support from developers. The reception was good across the board, with even the most popular technology news sites being genuinely optimistic about such an opportunity. With its 2013 release, Pebble dramatically stepped up the wearables industry by raising the standards. Despite its limited hardware – that features physical side buttons, a pixelated, black and white e-paper LCD screen, and a little vibration engine to alert you of what’s going on, Pebble’s humble approach, competitive price and viral fame led to it being the first proper smartwatch in many critics’ eyes. Soon enough people saw apps springing up from sports news to advanced automation. This finally looked like a “smart” smartwatch. But the Pebble wouldn’t penetrate the mainstream market despite all the functionality it offered. Perhaps it was the cumbersome controls, the unattractive carcass or the fact that many people didn’t – and still don’t – see a valid reason to justify spending over a hundred dollars on something that allows you to do what you can already do on your phone. The year was not entirely the Pebble’s spotlight, though. Samsung’s Galaxy Gear featured an Android-based OS that allowed you to check notifications and do some other things on a pretty color screen or take pretty pictures with a camera awkwardly mounted on the wrist strap. But whilst this was the best selling smartwatch of the year, the critics mostly overlooked it for not providing the same degree of functionality, customizability, and general developer and app support as the Pebble. Reviewers noted that 2013 marked a change in paradigm of what a smartwatch could and should do. However, despite Pebble’s high consumer-satisfaction rates and widespread acclaim in more tech-fan circles, it didn’t prove enough to push the smartwatch forward while carrying the burden of its failed competitors. Early in 2014, rumors of a Google watch began spreading, while those of the missing iWatch strengthened. 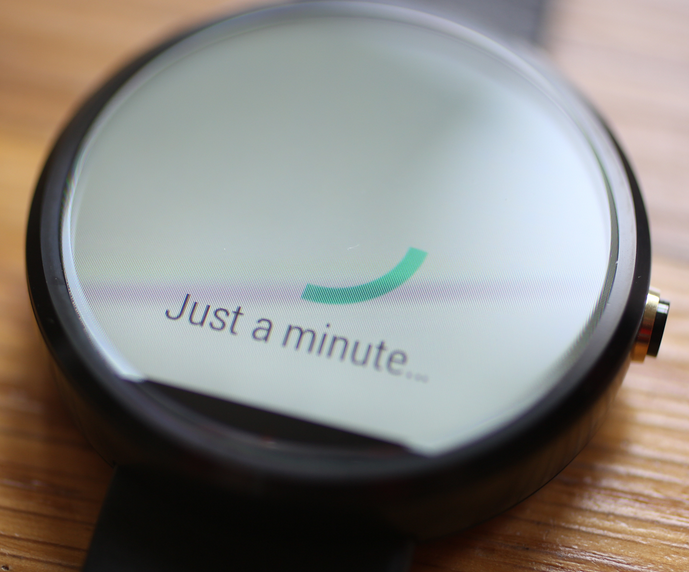 As time passed, the expectations grew higher until Motorola unveiled its Moto 360 in March of 2014. The device was universally considered the most beautiful smartwatch yet, and the enticing idea of an Android system entirely built with smartwatches in mind delighted the tech aficionados. After providing developers time to play around with development kits, Android Wear was released at Google I/O 2014, with the Moto 360 being delayed but having LG provide us its G Watch and Samsung its Gear Live. Android Wear allowed developers an unprecedented amount of freedom in app development, aided by direct support from Google with guidelines and documentation. I personally picked up a Gear Live expecting Android Wear to thrive with functionality, and was excited to see the growth of a brand new platform from its inception – an exciting opportunity that had the potential to finally turn the smartwatch into the revolution it was touted to be for years. For the past few months, the world of Android Wear has seen little innovation. While Google has provided us with much needed updates (up until the Moto 360’s releases and complimentary OTA, my Gear Live featured sluggish performance and sub-par battery life), none of them substantially improved upon the formula that they introduced at Google I/O. Many users were left with buyers remorse, and while I wasn’t one of them, I became the one that ends up responding the impressed acquaintance’s question of “should I buy one?” with “probably not”. In the same time frame as the latest 5.0 OTA for Android Wear, we saw the release of a Wear section to the Playstore. Before this, keeping tabs on Android wear development and app releases was rather complicated and involved actively searching for new content on forums. But to me, this new section showcases the conflict between Google’s promoted use-cases for Wear and the potential it could have. The section contains 187 applications, but many of the ones listed don’t really add anything to Wear – they just allow you to respond to the main apps’ notifications like Facebook Messenger and Whatsapp. The rest feature things like note taking and basic calculators, things that are built into the core functionality of Android Wear through voice commands. You’ve got apps like MediSafe touting Wear support – which is literally just displaying the notification it already displays in a prettier window. Others are games, that don’t really have place in a small display on your wrist powered by a battery that allows for very little gameplay time if you want to make it through the day. Then there’s the fact that the apps that aren’t like this, like internet browsers or social media readers, directly contradict Google’s vision of the platform – that of short, 3 second interactions – and are truly useless except for a few specific scenarios when you consider you must have a smartphone close to you for the smartwatch to do such tasks. So on one hand, the developer communities saw a great opportunity with Wear; but given the realistic usage restrictions of the hardware, guidelines and practicality, the room for creative, original and innovative additions to the app ecosystem is narrow. Then there’s the fact that for developer support to be significant there has to be a significant supply of users in circulation, which against most expectations cited earlier in this article, still isn’t reality. Smartwatches in general still haven’t had the market penetration that many predicted, and there are many reasons for this. Some blame it on lackluster hardware. The Moto 360 was awaited by enthusiasts partially because it was beautiful enough to finally entice the masses into buying into the trend. But the Moto 360 was blasted by critics during its first few weeks, because of dreadful battery life reports, a screen that didn’t dim as power-efficiently as the previous offerings, an old processor that slowed down the phone while sapping it of its battery, and many build quality and hardware complications such as epidemic screen burn-in, cracked backs and dead pixels. What could have been the messiah of Wear failed and disappointed, and by the time many of these issues were addressed or fixed, the hype had gone down and the reviews were in place. The damage was done, and despite the neat circular display and gorgeous chassis, it wasn’t enough for people to overlook the defects and bad reputation all while making the leap of faith into an expensive but truly not necessary piece of technology. Other people say the lack of a strong user base despite all the hype from analysts over the years is due to the fact that there’s nothing innovative about Android Wear. While current Google Now on your wrist is something that would have blown all of us 90’s kids’ minds away back when we were growing up, in the adult world it is hard to justify shelling out hundreds of dollars for something your phone already does and does well. And I’d argue Google Now and all of Wear’s voice commands are one of its strongest points, too. But it seems many are content with taking out their phone to check and reply to their notifications and messages. I’ve been asked what kind of apps my watch runs, and when I tell them I don’t really use many apps on it, they look at me disappointed. Many casual users equate applications with functionality, and it seems Apple noticed this, as its Apple Watch seems to hold apps as a central part of its user experience, even giving them a galaxy-like drawer for users to find them at. I think this approach is not as efficient as Google’s “short interactions”. But when I think about why Wear hasn’t seen the growth in popularity and ecosystem both developers and users wanted it to have, I realize that it could just be Google’s paradigm holding it down. Ultimately, the revenue for mobile developers come from apps, and apps as we conceive them in smartphones are simply incompatible with the use cases of tiny screens on your wrist that don’t live through the day when you use them very much. So in the end, it is not an easily traceable issue, but rather, it is an epiphenomenon. Developers struggle reaching to a small consumer pool with wear apps that don’t innovate and don’t entice, so people don’t consume the apps on their watches because the developers don’t have enough justification to put out innovative software. This lack of innovative software turns down potential buyers, which rekindles the slower adoption rate that was predicted, and thus begins the next iteration of the cycle. In a way, developers are conditioned by the market which is conditioned by developers, and the minimalist paradigm of Google coupled with the real-world unwieldiness of smartwatches. There’s potential functionality and innovation that’s been mostly untapped, either due to system or hardware restrictions. I’d love to see the ability to initiate in-app actions by saying “Ok Google” from the watchface. But we weren’t even allowed to initiate Hangouts conversations through Wear. These sorts of nuances make Wear feel unpolished and critics complained about them time and again, but the infrequent OTAs address such complaints at a steadily short-reaching pace. Despite the lack of innovative software features or functionality, Wear remains deeply integrated into some users lives including my own. I personally don’t believe apps should be the focus of smartwatches nearly as much as Apple intends it to be, but I do realize that apps seem to be one of developers’ main ways of benefiting from the existence of such platforms, and after years, most of us have been conditioned to downloading and using apps that enhance our lives. Maybe Apple will prove that applications can work on a smartwatch in an organic way. Maybe they will push forward developer growth in this sector. Maybe they won’t, and maybe Wear will unexpectedly win the wearable OS war that is in the horizon through the help of inspired developers and software innovations. Whatever happens, Wear is still a decent product that just needs some polishing. And while it seems that smartwatches haven’t had the estimated boom of the more optimistic analysts, it has met with steady adoption and market growth during 2014 and that is enough to celebrate. Lets just wish there’s ways for both consumers and developers to mutually and extensively benefit from the platform’s existence in the near future.